Back in the 1960’s, Flint Gennari was getting his name up, without even realizing that what he was doing was a precursor to modern graffiti. 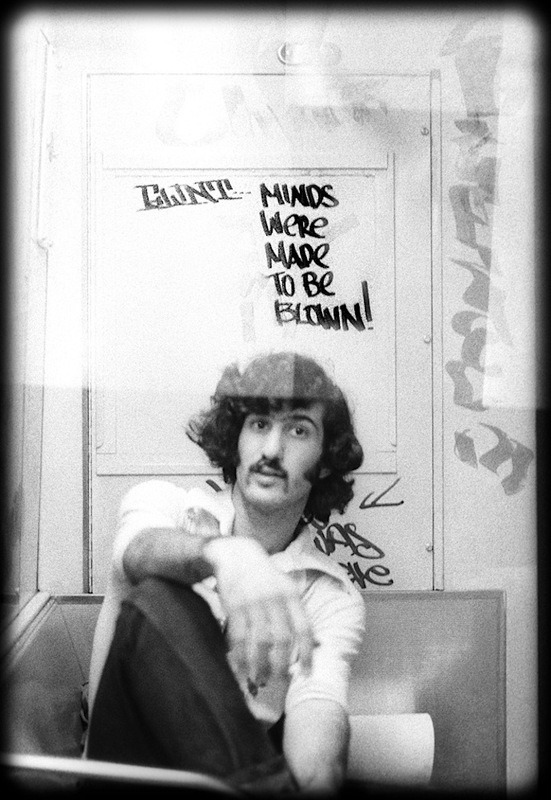 It was wonderful to have an opportunity to meet up and speak with this graffiti pioneer. It was back in 1966. I was nine years old, and I was traveling and camping cross-country with my family during our summer vacation. I was already aware of the mindless scribing on the bathroom walls. I’d seen “John loves Mary,” “For a good time, call…” Why not write something profound or, at least, interesting — since you have a captive audience? 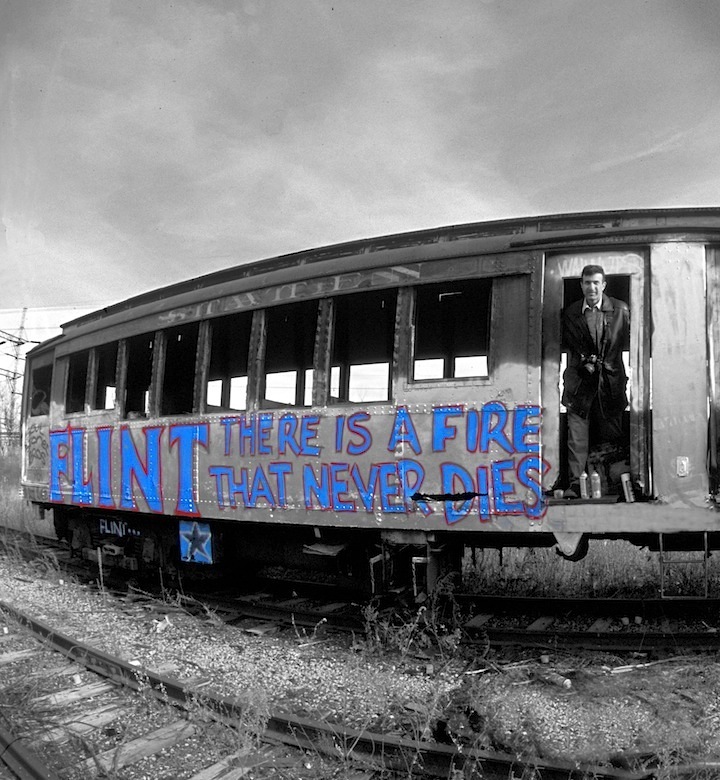 I started writing sayings and signing them FLINT. Anything that caught my fancy would work — something from a fortune cookie, a great lyric from a song or a quote that offers advice. It didn’t matter that people didn’t know what to make of it. I had a secret identify, and it kept me busy. Gee! You must have been quite precocious! And what about your name? What inspired you to start writing your name in public spaces? I had been learning about World War II in school, and I became obsessed with the phrase, “Kilroy was here.” Who was Kilroy? And why did he write his name everywhere? Like Kilroy, I liked the idea of advertising myself. I had hearing and speech problems, so I couldn’t understand much of what was happening in the classroom. This made me me a loner, but I found something that could make me part of the world. I was sensitive to social change. It was the 60’s. Things were changing, and I wanted to be part of it. Did any particular writers or artists inspire you? 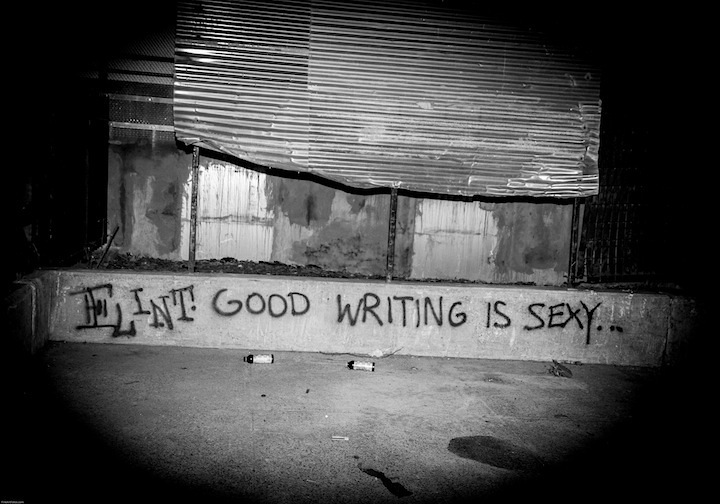 There were no writers at the time. Graffiti – as we’ve come to know it – didn’t yet exist. I was influenced by Madison Avenue ads and slogans. They would bombard you with whatever they were trying to sell. The artist Peter Max was commissioned to make art to be placed on mass transportation. He always made his name the centerpiece of the work and placed his art — angels, butterflies, fairies etc — around his name. Was he smart? I think so. I spent lots of time – as a kid — with Marvel comic books and movies. These characters were cool; they would do what they wanted. I became a real James Bond fan. And so I took the name of Flint, the master spy who spoofed James Bond. They hated it. 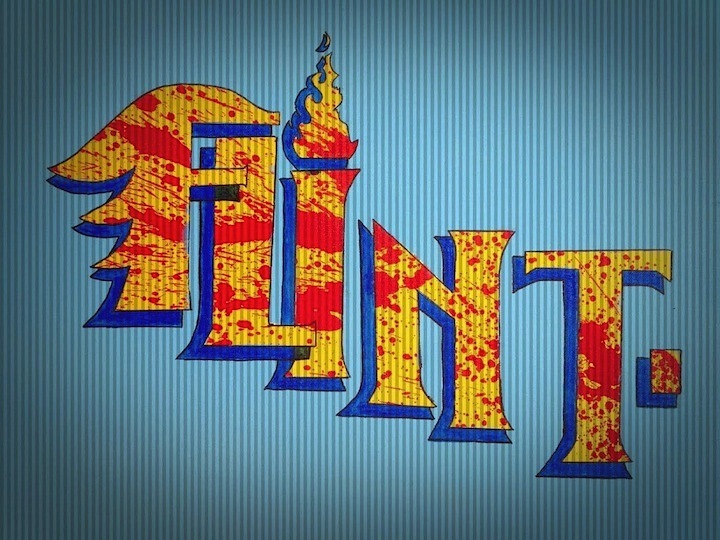 They hated the name “Flint,” but it was my given name. I gave it to myself. Yes, I was the black sheep of the family and I was always in trouble. What about crews? Did you join any crews? As time went by, many more writers started in Brooklyn. Scooter and Dino Nod lived in the same apartment building two blocks away. And Flip One lived In the other direction — one block away. Erasmus High School was nearby, along with Mico, Mani and Wicked Gary. 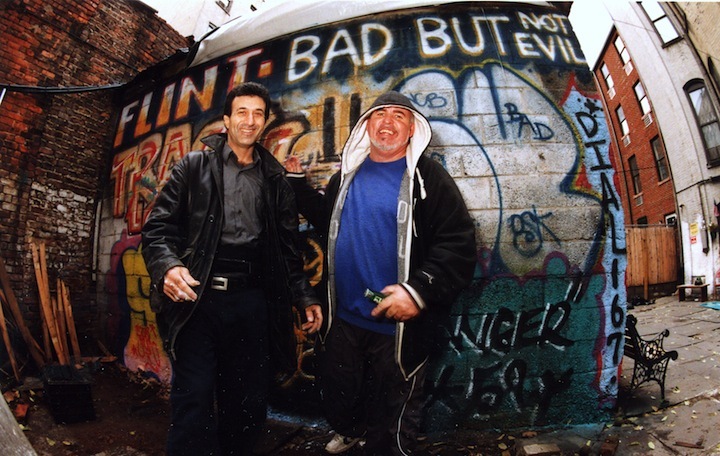 Dino Nod was the president of the ExVandals — the first-ever graffiti crew — and I ran with him. Then with my writing partner, LSD OM, I founded the Rebels. Future Rebels members included writers such as Shadow and Zephyr. Were you influenced by these other writers? Did meeting them affect your style? It was when I met these other writers that my sayings changed. I started writing more for them, and messages like For Those Who Dare, For Ladies Only, Bad but Not Evil and The Time Will Come... started turning up. Every time a writer gets up, he is taking a risk. But probably the riskiest thing I did was climbing down from the el to avoid the cops. I attended the High School of Art and Design, the greatest “writing” school out there. In the lunch room we all sat at the “Writers Table,”passing around our black books and refining our tags. In fact, Art and Design is where I met Al Diaz and influenced him and Basquiat to write messages.” On a more formal level, I took some classes at Pratt and at the International Center of Photography. But I’m largely self-taught. You are an active photographer as well as an artist. At what point did your focus shift to photography? I stopped hitting train stations and most public surfaces in 1976. And the following year, I began a 10-year project of photographing a drug addict. But even as a young child – before I could afford a camera – I loved photography, and I would borrow my father’s camera to photograph my friends. There was a time when it became a choice between doing pieces or photographing my friends doing them. This is how the video footage for my graffiti song came about. I remember when my friends Flip One and Dime139 asked me to hit the yards. I ended up doing more photography than hitting that day, but this was 1975 already. Have you exhibited your work in gallery settings? Yes. I’ve exhibited both my graffiti and photography. Before I graduated from high school, my work had won a Scholastic Art Award and was exhibited nationally. 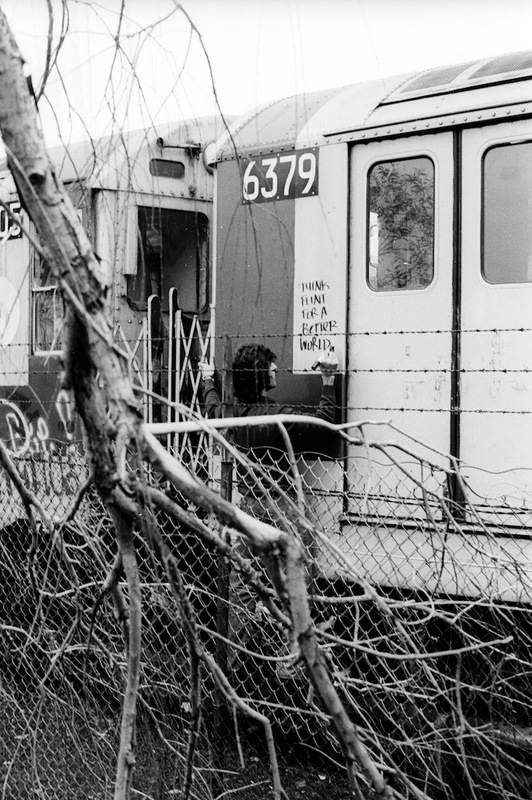 Then in 1998, Hugo Martinez, the founder of the United Graffiti Artists (UGA), saw my tag behind me at B&H photo, where I was working at the time, and gave me an exhibit at his gallery in Chelsea. That opened my eyes to how big graf had become: I had no idea! Since, I’ve exhibited worldwide and was featured in Born in the Streets at the Fondation Cartier in Paris. Why do you suppose the Europeans are more receptive to graffiti than we Americans? Europeans have always understood and respected art, particularly art that’s a bit out of the mainstream. Just look at how receptive they were to jazz musicians! All of it, though most of it is focused on my photography business. I’d like more time to focus on my own art. I do get orders for canvases and water colors all the time. Music. I play the guitar and I write songs. I was the rhythm guitarist for the Ex Vandals Band. Stan 153 played bass; wicked Gary was on percussion and Bama/Amrl was the leader and on drums. It’s all a means of expression, and we influence each other. It means something special, though, that we graffiti writers are a part of New York City’s history, and that we writers have invented a new American art form which is still evolving. But I’m not a purist. I think Banksy is terrific. It’s great. I’m seeing and enjoying new things all the time. And it goes without saying how easy it has become to showcase what you are doing to a much bigger audience. Have you any feelings about the photographers and bloggers in the scene? At the beginning, graffiti was considered nothing more than vandalism. When you became a writer, you entered a brotherhood with benefits. You belonged to a family of like-thinkers who, along with you, were creating something — without knowing exactly what. I’ve had life-long friendships with many of the pioneers such as Tracy 168, Stayhigh 149 (R.I.P) and Taki 183. Back in the day, we never would have imagined just how influential graffiti would become – that it would impact everything from fashion and marketing to the “art world.” Graffiti will continue to evolve, and its influence is likely to increase. Interview by Lois Stavsky with Richard Alicea; all photos courtesy of the artist; first photo, Flint and Tracy 168. Thanks! I love speaking to folks who were there at the beginning of it all! We owe a lot to them. The unselfish work you do on behalf of our Culture, is tremendously appreciated by ALL OF US who are part of this unique Culture that we first called ” Writin’ “. Peace and more power to ya!